The mechanisms and contexts of human communication are rapidly changing in the face of new domains of interaction, new technologies, and new global cultures. Contemporary forms of discourse often involve interaction with and through a plethora of technologies. These mechanisms and contexts provide both new artefacts of study and new tools for discourse analysts. 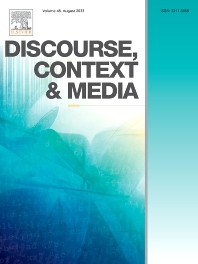 Discourse, Context & Media is an international journal dedicated to exploring the full range of contemporary discourse work. It provides an innovative forum to present research that addresses all forms of discourse theory, data and methods - from detailed linguistic or interactional analyses to wider studies of representation, knowledge and ideology. The journal overtly seeks empirical contributions as well as papers that address the theoretical and methodological debates within discourse studies. Such approaches include, but are not limited to: conversation analysis; ethnomethodology; discursive psychology; critical discourse analysis; and sociolinguistics. The journal seeks to explore the challenges and opportunities provided to discourse scholars by digital media. Such media provide opportunities for new forms of data to be analysed, allow rethinking of existing theories and encourage the development of new models of interaction. Discourse, Context & Media is especially interested in contributions that make use of innovative methods and media for the analysis and presentation of data.